Noshiro Rocket Testing Center began in 1962, as one of the research sites of the Institute of Industrial Science, the University of Tokyo (the origin of the former ISAS, which is now a part of JAXA). 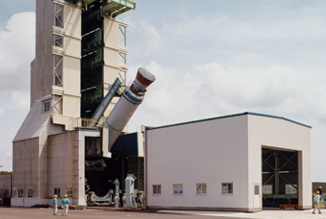 Noshiro Rocket Testing Center has performed a wide range of static firing tests of rocket motors used on the M rocket to launch scientific satellites, space explorers and sounding rockets. Since 1975, ISAS has been developing liquid-oxygen and liquid-hydrogen propellant rockets here. In 1988, we started the world's first R&D efforts on the high-performance, air-turbo-ramjet (ATR) engine. We also conduct development and testing of new solid-fuel motors here, and development and flight-testing of a reusable rocket engine. The Testing Center is located on a strip of land running north and south along the coast of the Japan Sea in Asanai, Noshiro City, Akita Prefecture. 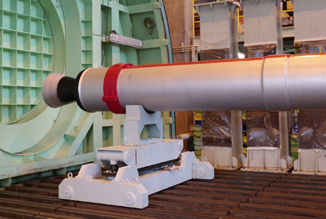 It has static-firing test facilities for solid-rocket motors and system test facilities for liquid-oxygen and liquid-hydrogen engines. This is where combustion tests are conducted to check the performance of large solid-rocket motors that fly in the atmosphere. Fixed and movable domes cover the test site to protect the testing motors against weather effects. A flame deflector made of fireproof concrete deflects and diffuses the exhaust gas upward into the sky to prevent pollution of the surrounding sea. This is where combustion tests are conducted to check the vacuum-flight performance of rocket motors. Both vacuum and atmospheric combustion tests are possible in the large vacuum chamber, which can contain a solid motor up to 10m in length, 3m in diameter, 30 tons in total weight and with a thrust of 150 tons. With its enormous capacity and structural advantages, the vacuum chamber is also utilized for many other scientific and engineering experiments.